Got a chance to use the Paint Crew pro this weekend. Finally, it wasn’t raining on the weekend! Spraying Sherwin Williams A-100 oil based exterior primer. It worked outstandingly. Astoundingly. As in, I’ve used one before (not for oil) and forgot just how well they work! The gun came with an .015 orifice. The Sherwin Williams guy talked me into buying a smaller orifice (.013) for the oil-based primer, even though the can called for a larger one. Well, he knows his stuff. Fine, very controllable spray. No over-spray problems. Could paint within a quarter inch of something without spraying it, and a piece of cardboard held up made a fine edge. The only drawback with spraying oil based, was that cleanup took 20 minutes and a gallon of paint thinner. WELL worth the trouble. And I should mention that the cleanup of ME was much easier when using the spray rig. 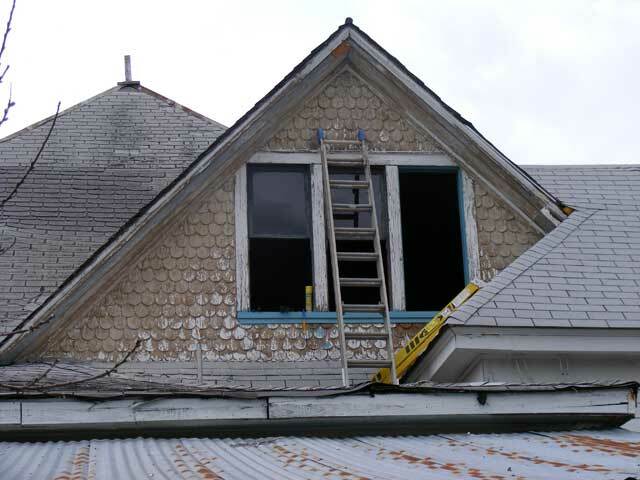 I only had one drip on me, and most of the eave painting I was doing overhead. The brush was MUCH messier on me LOL! About 10 minutes to set up the rig (and I had not done it before, it’ll be 5 minutes the next time). 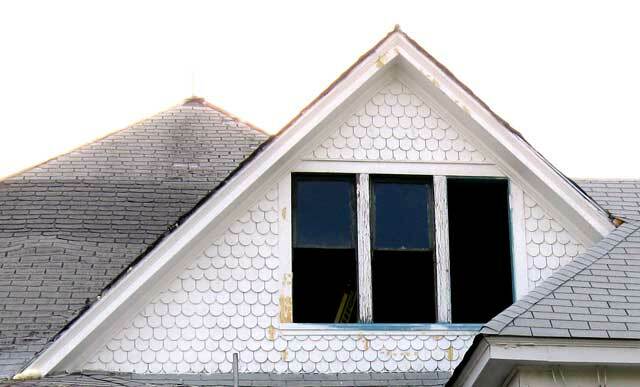 20 minutes, including all the ladder acrobatics, to prime the dormer…fish-scale and eaves. 20 minutes of cleanup. That would take 10 minutes with latex. I figure it saved me about 4-5 hours of work AND I got excellent coverage, which on those scales, I was not happy with what I was getting with the brush. May have actually saved me about 10 hours work as I don’t expect to need a second coat of primer. It used no more paint than the normal coverage spec for the primer. The next morning I caulked everything and puttied the last of the divots. It will be ready for a finish coat next weekend. Primered! The visible pox left up there is the last wood-puttied spots…this pic was after the primer had dried for a day and I caulked and wood puttied any thing left that needed it. The center window trim that hasn’t been primed, as I’ve more work there first. Should be ready for a finish coat next weekend!